Motivated Seller! Price Negotiable! Lovely resort with breathtaking ocean views.Buyer may receive a title fee credit, inquire for details!!!! 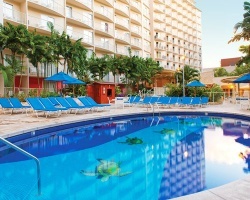 *Wyndham at Waikiki Beach Walk* is situated on nearly eight acres along well traversed Lewers Street in Honolulu, Oahu! This beautiful property is being showcased as an energetic and exciting destination to play and to stay! An outdoor entertainment plaza, forty new retailers, six great restaurants, and four hotels will welcome visitors and island residents alike who come to redefine the Waikiki experience! For more information about this beautiful property, visit www.clubwyndham.com. *RCI Affiliated Resort* Featuring finely appointed floating accommodations. Biennial odd usage is based on points, with 231,000 points every other year included in the sale. Points are available for immediate use!Points can be used to stay at this tropical resort or any resort in the Wyndham network. For more information or to make an offer, please submit the inquiry form.